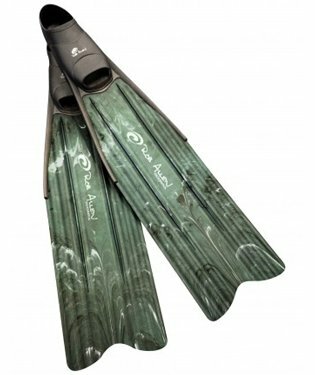 One of the most critical pieces of spearfishing equipment you need for your spearfishing adventures is a dive float and flag. 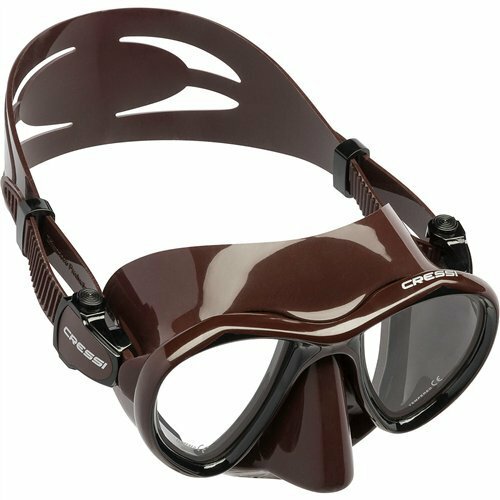 Not only does it make you much more visible in the water to any boats speeding past, the best spearfishing float will also provide a handy bit of storage when you’re on the water. And you can hang onto it if you ever get tired. With the right setup, your float provides an anchor to your speargun, so you never risk losing it. If you make a lousy shot on a big wahoo and it tears off into the abyss, all you need to do is follow your float. 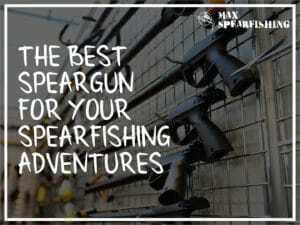 It’ll stop the fish diving down, and you can retrieve both your gun, and the catch of a lifetime. Right. Let’s get straight to it. What I particularly like about this float from Rob Allen (over all the others we reviewed for this guide) is the hard shell. Air-filled floats do have a place, they’re compact and make it easier to store, but they’re just not as durable. If you’re looking for a streamlined float, that cuts through the water and will stand up to any abuse you can throw at it. This is the best you’re going to find, click the below and order yours today. 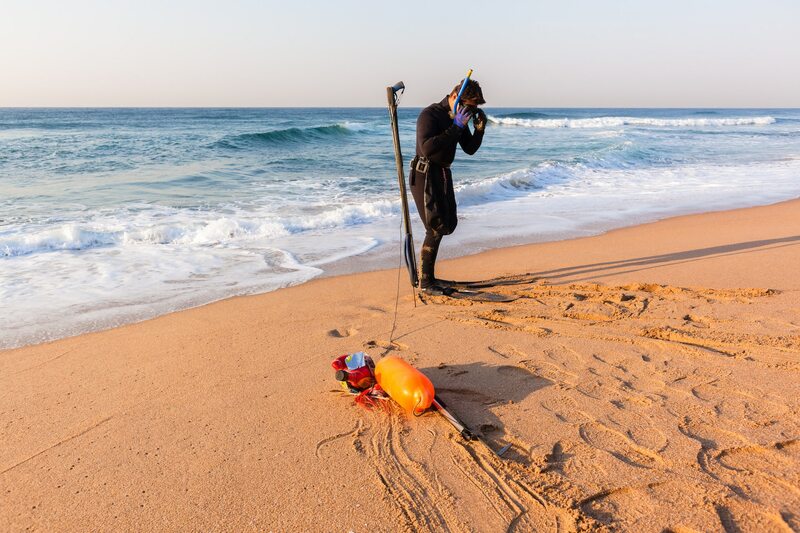 This spearfishing float is the best option for anyone crazy enough to be spearfishing from the shore without a boat to back you up. 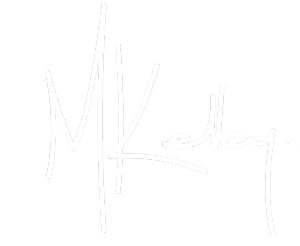 It’s essentially a tiny, inflatable boat, that you can use instead of a float. When I started pushing out to an off-shore reef, this little beauty was my saving grace. There’s space to hold water, all of your catch, and if you ever need a breather it’s more than floaty enough to hang onto yourself. Inflated Measurement: 35" x 24" x 11". 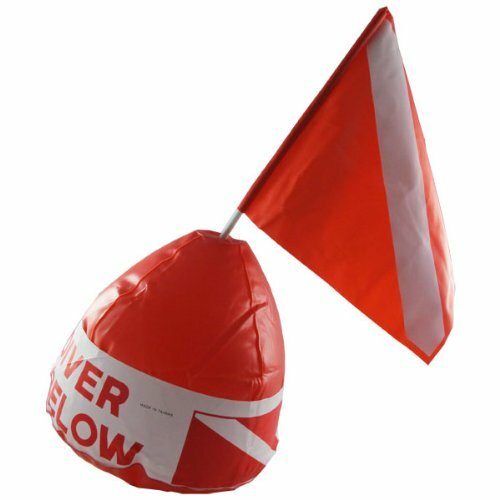 - Dive flag measurement: 10" x 8". 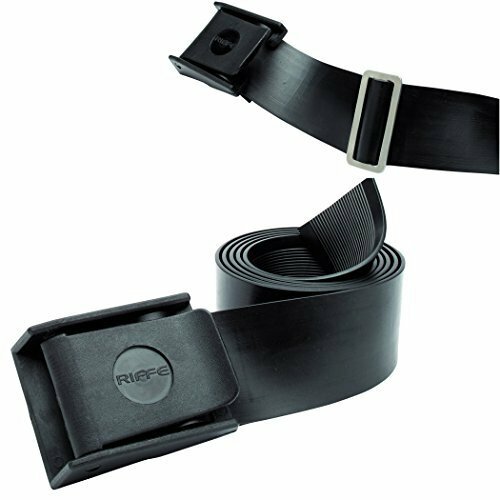 Pole length: 19-3/4", 1/2" diameter. Include 6 plastic d-rings on the bottom and 5 plastic d-ring on the top side. 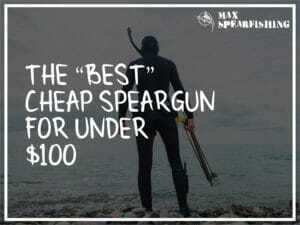 Simple and effective, if you’re looking for a cheap spearfishing float this is your best bet. 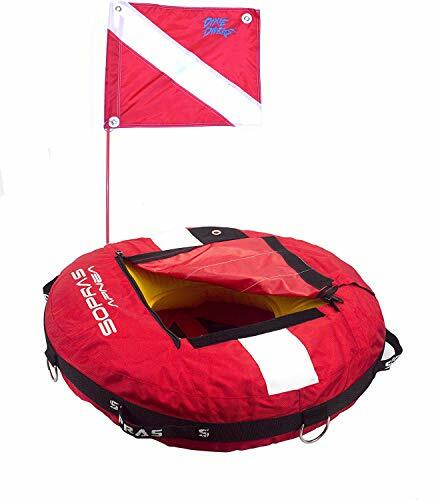 It’s inflatable so it can pack down easily at the end of a dive, and needs just a little water in the bottom to keep your flag upright in the water. Don’t make the mistake of going into the water without showing the boats where you are and get this now. 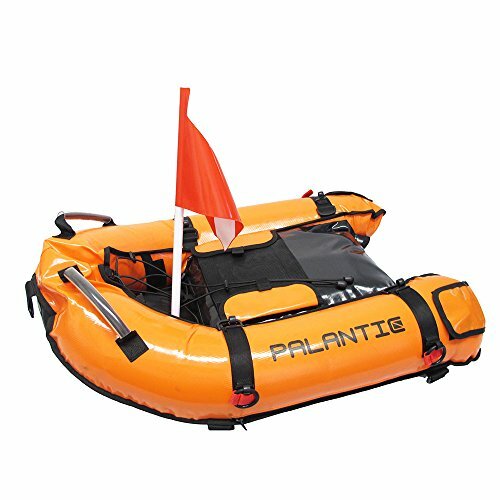 Similar to the Palantic Float Boat, this buoy is another good buy. It’s a little smaller at only 26 inches from side to side, the biggest difference is the circular shape instead of a boat. I really like the heavy-duty fabric covering, as it’s quick drying and gives you an extra buffer against any rocks or coral, but it does feel a little less streamlined in the water. If you’re concerned about the wash from the rocks because you’re diving in a shallow reef, this would be the float to get. 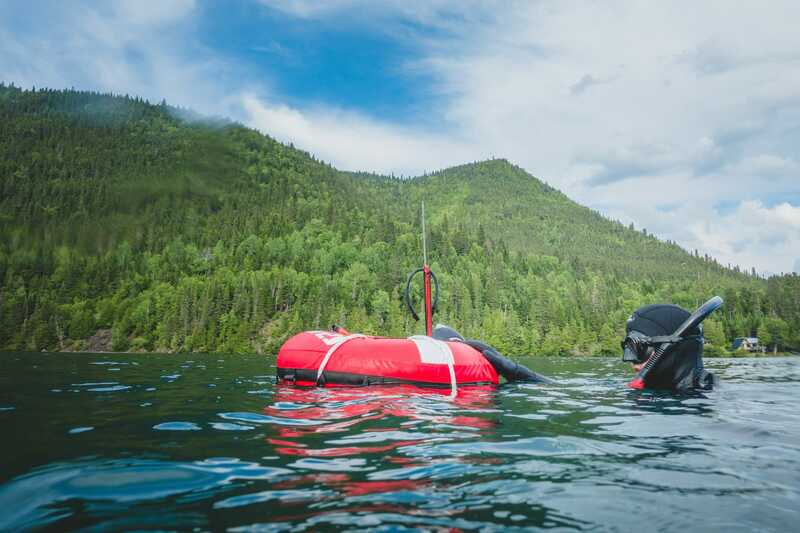 Containing two separate bladders within a heavy-duty nylon cover, this dive float from Omer is both easy to use, and “floaty” enough to hang onto when you’re in the water. There’s plenty of clips to hand your stringer and attach other gear like a back-up pole spear, and it’s relatively streamlined in the water. 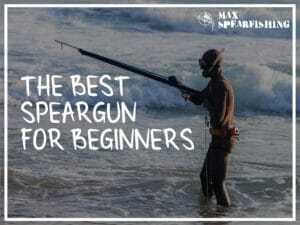 When I first started spearfishing I didn’t have a spearfishing float. I’d thread my caught fish straight onto my mono so they’d rest along the barrel of my speargun, and the first time I caught a lobster I simply held it clutched in my grip as I swam the couple of hundred yards back to shore. It wasn’t very optimal. Not to mention safe. Where I grew up there wasn’t a whole heap of boat traffic, but there were sharks. After a little Tiger tore a Bream off the end of a friend’s spear while on a dive, I realized I no longer wanted to keep my catch so close to my hands. 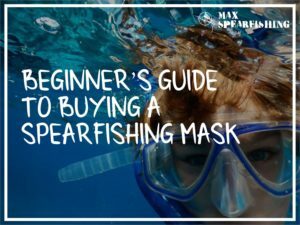 So, I started researching spearfishing floats. My advice, is to buy one. I’ll get into the “whys” in a sec. 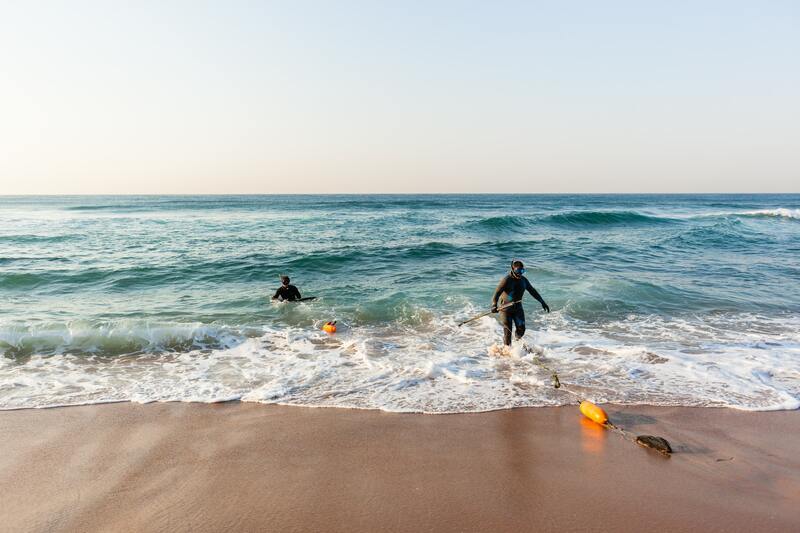 Depending on where you’re spearfishing, you may be legally required to have a dive flag. It’s for your safety, and those cruising by on boats around you. It’s important you’re highly visible in the water. 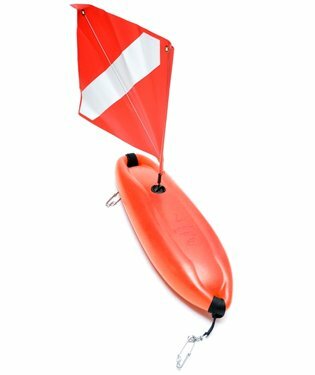 The flag and a bright orange float makes it easy to spot you, and avoid running you down in a tragic boating accident. Pick something highly visible, that’s also big enough to hang onto if you need a breather in the water. But visibility is not such a big deal for me. It’s important yes, but what I love about having a float with me while I’m spearfishing is that it’s a place to keep everything. I’ve got a bottle of water. A stringer to store my catch. A pole spear just in case. It’s like a floating backpack of gear that I have within easy reach, so I’m always prepared on a dive. 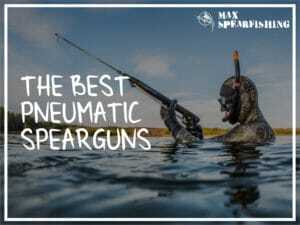 A float can also provide a lifeline to your speargun. 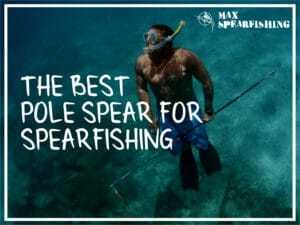 Even if you’re only targeting small reef fish, if you’ve got a line connecting your speargun to your float you will never lose it in the ocean. This means you can set it down if you’re trying to pull a lobster from a cave, or if you need to readjust your mask. It’ll be there on the end. And just in case a monster wahoo decides to stick his head out at you, taking that shot is now possible because you can let go of your gun once he takes off. Just follow the float to your prize. What type of float do I need? 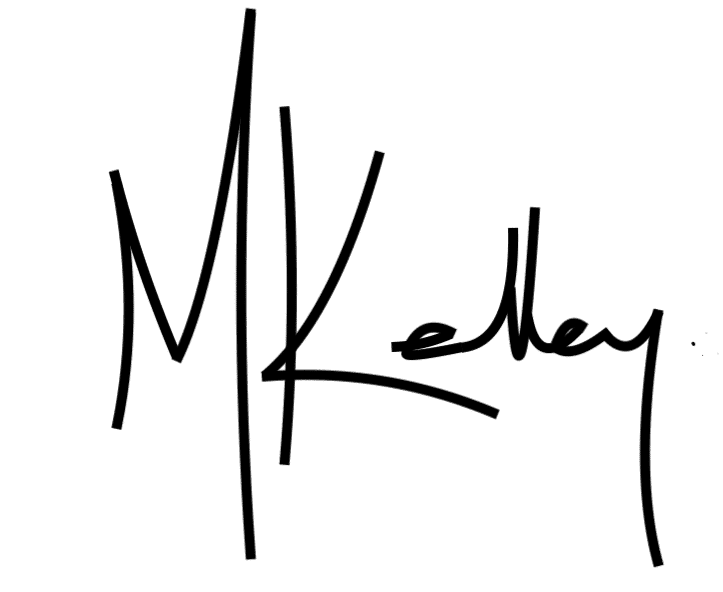 Personally, I’m a fan of anything that’s going to make my efforts swimming through the water easier. Less drag means less effort to pull it, which makes it far easier to swim. I’d recommend getting a torpedo-shaped float, so it can easily cut through the water. Next comes the size. Of course, you could use a smaller buoy but remember that this may get pulled under if you happen to shoot a larger game fish. I’d not go with anything less than 35lt if you’re spearfishing in deep water, and I’d also advise against an inflatable. You want a hard shell, filled with foam, to ensure it will always maintain its buoyancy. It’s not rocket science. Your float and dive flag are at one end. There’s a piece of float line connecting the float to your speargun. And of course, your spear is connected to your speargun. 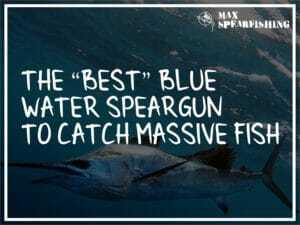 There are different setups you can use for blue water spearfishing, like the breakaway setup that allows your shaft to break free from your speargun completely, but I’ve found this is the simplest setup that works for the majority of my dives. No need to overcomplicate things, unless you’re specifically chasing big fish. So you just need a length of float like to connect your float, to the base of your speargun. 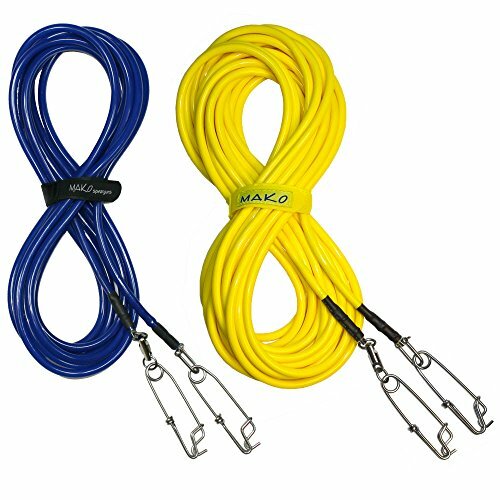 There are many different types of float lines available, the key here is to find one that floats, and won’t tangle as you dive. Like this. Here’s where things get a little fun. The first spearfishing float I made was god-awful. I wish I had pictures of these but we’re talking pre-digital camera days now (I know, I know, I’m a dinosaur). I took two milk bottles, wired in a bit of dowel with a flag on one end and a few sinkers on the other, and painted the whole thing with a can of fluorescent spray paint. Tied underneath was a net bag for my lobsters, and a stringer for my fish. It was about the second or third dive the paint started scratching off, and by the end of that particular summer the whole thing was trash. The next was a little better. Taking an old bodyboard we had in the garage that I no longer used, I decided this was the base for my next project. 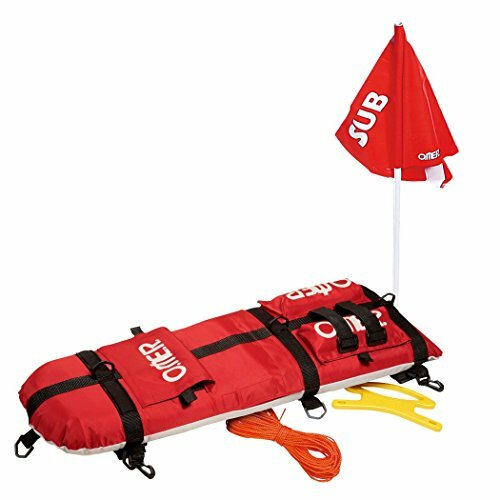 I bought four new plugs (basically just the plastic screw-in inserts you use to attach an arm-rope to your bodyboard), and used these and my net bag to create a little bag section on top of the board. I flipped the plug that was already on the board so my tow-line would attached underneath (instead of on top) and this was also where my stringer clipped on. Finally, I drilled out a hole to feed my dive flag through in the back of the board. This new setup lasted me for years, until I upgraded to a proper spearfishing float. 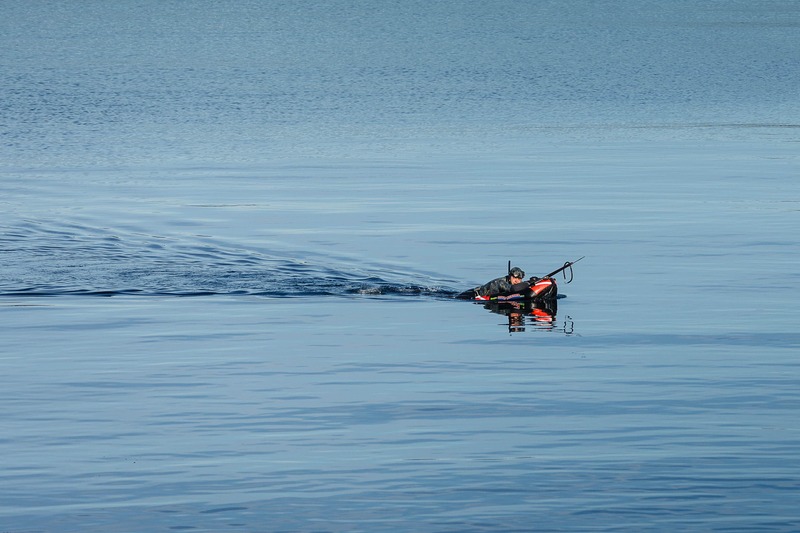 Having a decent spearfishing float is critical when you’re trying to catch a feed of fish. In addition to keeping you safe and visible in the water, there’s no better option for keeping your catch and any extra spearfishing gear you need close at hand. I’ve been chasing fish since I was 15, and I’m crazy passionate about spearfishing. 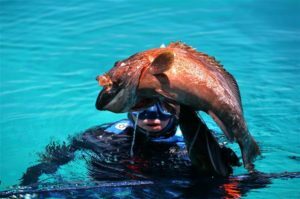 I’m Australian, (don’t hold that against me), all I want to do is share my thoughts and experiences spearfishing in the big blue sea to help you catch a fish or two. 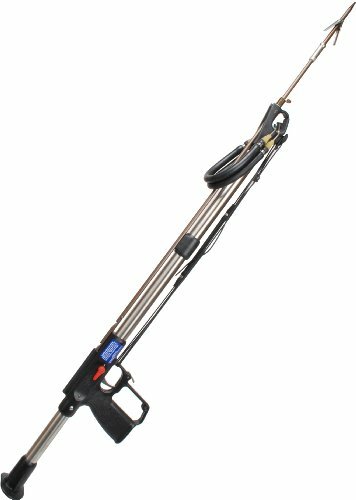 AB Biller SS42 Stainless Steel Professional Speargun, 42"